Since she did not own a bike, running was the obvious choice. Alison has been a competitive hockey player her entire life and figured running would not be a problem. She drove herself down to Sea Point promenade and set out to run as far as she could. Less than one kilometre later she called it a day and drove back home. Undeterred Alison went online and entered the Two Oceans half marathon (this was in the days before you needed lightning-fast typing skills to get an entry), figuring she’d manage another 20km if she trained a bit. Although the race’s motto is #RunAsOne, our prudent protagonist preferred to #TellNoOne – keeping her goal a complete secret from friends and family. The training went well and she was ready for the big day. 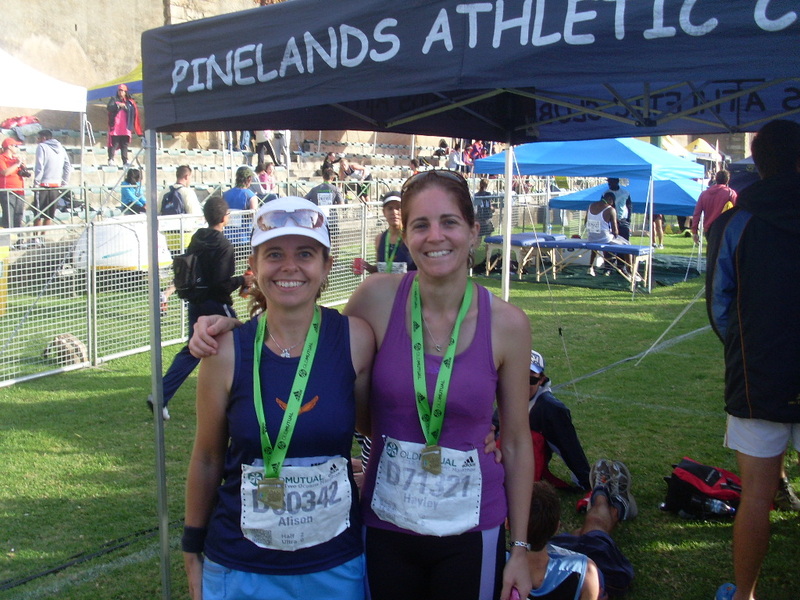 As soon as she could walk properly again, Alison trotted off to her local running club (Pinelands AC) and signed up. She thought she was a big deal after her debut half marathon but soon caught imposter syndrome again, surrounded by runners who’d run hundreds of halves and others who casually talked about their marathon and ultra plans. Alison relaxes with her sister at the Pinelands AC gazebo after one of her three half marathons. She subsequently upgraded to the ultra and will be running her sixth Two Oceans Marathon this year. 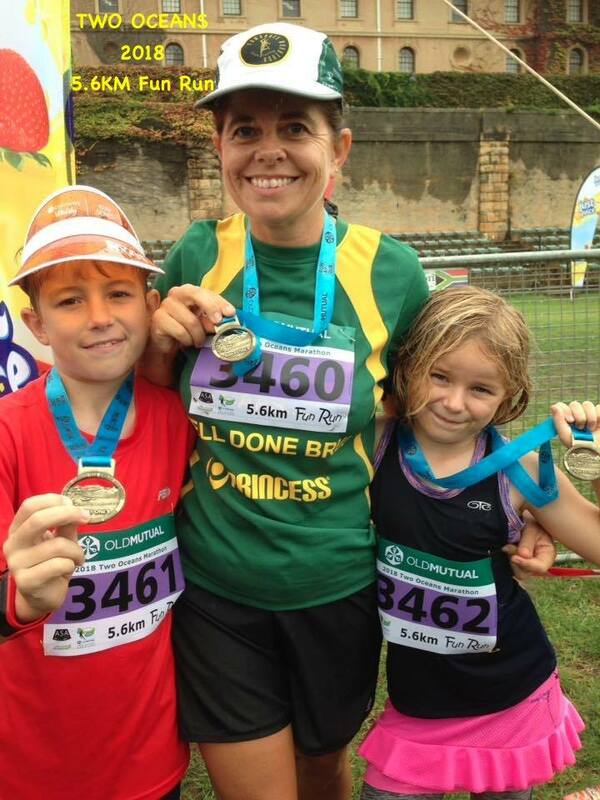 Spreading the Two Oceans spirit – Alison enjoys running the Two Oceans Friday Fun Runs with her niece and nephew. 2019 goal: Blue medal (6h30m). Advice for other blue medal hopefuls: Left foot, right foot, left foot, right foot – repeat until someone puts a medal around your neck! Advice for novices: Don’t let it stress you out if you can’t sleep the night before the race, it’s totally normal! Best part of the race: I enjoy the second half, the scenery is incredible and I enjoy the challenge of being really tired and pushing through anyway. Worst part of the race: Standing on the start line, I do not enjoy being around so many people. It’s all in the mind: I have weird dreams before Two Oceans. 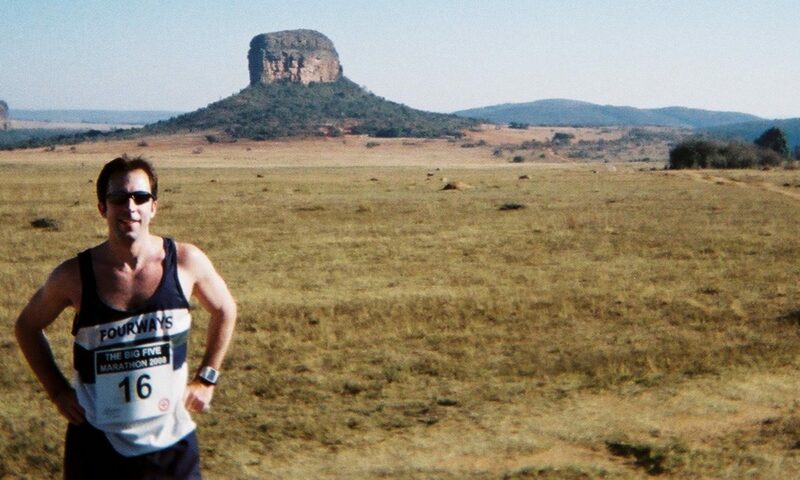 Like the year we ran the Ou Kaapse Weg route, I dreamt that at the top of Ou Kaapse Weg all my teeth fell out! I have no idea what that means, but luckily it didn’t actually happen! Top tip: Put some lip ice in your pocket, it can help with many ailments! Look out for more great Two Oceans Marathon human interest stories coming soon. All photos supplied. Header photo: Alison enjoying the Big Bay parkrun. Next PostNext Blue at Two Oceans Marathon? Blame your Mother-in-Law!